Tuff-Post posts are designed and engineered to meet a growing demand in the post frame construction industry. Tuff-Post posts are designed and engineered to meet a growing demand in the post frame construction industry. Every Tuff-Post comes with a full life-time guarantee. 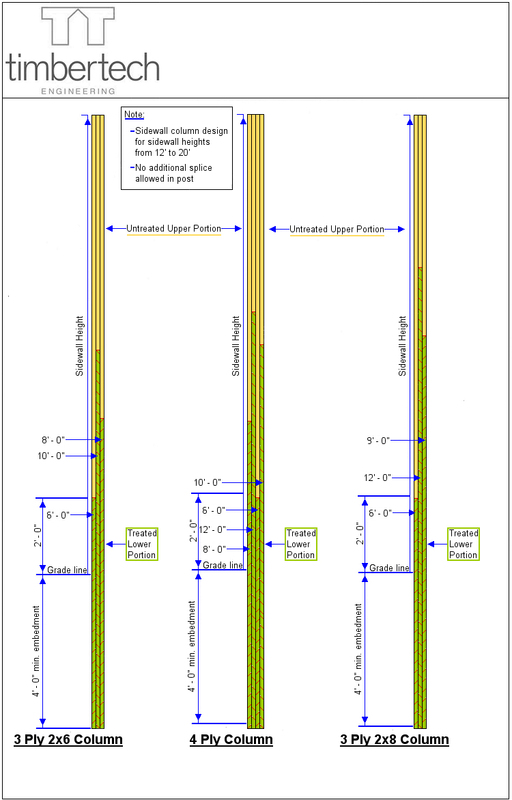 We engineer our post to meet the specific requirements of each building. It is important that you provide all of the information for your particular building before ordering, so we can ensure the post won’t be under-sized. Tuff-Posts are made using .60 CCA Treated #2 Southern Yellow Pine & #2 non-treated Southern Yellow Pine. The posts are glued and hydraulically pressed, then mechanically nailed. After the fastening process is complete, the post is planed on both faces, producing a straight finished post. Below is a chart illustrating the treated area each particular post. Dig hole in accordance to footer size and depth required. This may vary depending on building size, soil type and building code. Use either cast in place concrete or pre-cast concrete cookie for the bottom of the hole, again the amount of concrete or size of cookie will depend on building size and soil type. Concrete must be cured before post can be planted. Set Post in hole, the treated (green) end should be down in the hole. The 2x4 horizontal exterior wall girt should be nailed on to the 4 1/2" width side (the side that shows 3 boards) of a 3ply column. If you are using a 4ply columns then nail your horizontal exterior wall girt to the 6" width side (the side that shows 4 boards). The 3ply or 4ply side of the column should be facing out towards the horizontal wall girt to provide maximum strength. *If a post is set in concrete, a post sleeve, or post wrap is used, provisions must be made to allow for post shrinkage and to allow water to escape. Water must not be allowed to be trapped between concrete or post sleeves and Tuff-Post, otherwise the warranty is invalid. Tuff-Posts are warranted to the original property owner against damage by termites or fungal decay which will make wood posts Tuff-Post Warranty structurally unfit for their intended use as structural posts in post frame construction. This warranty is good for the lifetime of the original property owner. It is not transferable, sellable, re-assignable, or inheritable. When adjacent ground surface is not sloped away from the structure at a slope of not less than 5% for a minimum distance of 10 feet measured perpendicular to the face of the outside wall. Provision shall also be made for drainage of accumulated surface water or urine, including water from roofs, etc; away from the foundation to a natural drainage area or sewer.